With the London 2012 Olympics in full flow, I was keen to ensure my 2 young children watched and learnt a bit about it even if it was just a few new sports that they learned about. Miss M was keen to watch the gymnastics and trampolining as she currently has lessons in both of these but has also enjoyed the swimming and diving disciplines to name a few (the diving is probably helped by the fact that we pop to see Tom Daley train in the pool across the corridor after her weekly trampolining lesson!!). So a key part of this is the Olympic mascots – Wenlock and Mandeville. An ideal souvenir for your child and something to help them engage with the Olympic Games. We received a 30cm Wenlock plush and a 8 colour Wenlock pen to try out. I wasn’t sure what Miss M would make of them but as soon as she met Wenlock she was glued to him. He has remained stuck under her arm, gone shopping and sleeps in her bed with her. It has been great as whilst watching the Olympics every time we see the Wenlock icon or logo she shouts his name out and it has become an instantly recognisable figure for her. The 30cm plush is very well made with lots of detail to represent London as well as the Olympics. The top of the head is shaped like a light to symbolise the London taxis and upon this are three stripes that stand for the 3 medals given out for each sporting event. 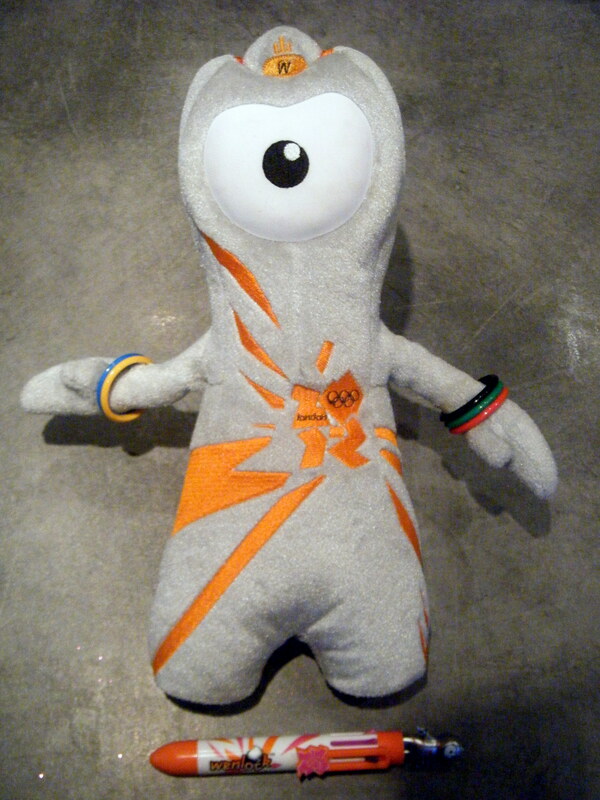 Wenlock also wears friendship bracelets in appropriate colours to represent the Olympic rings. The Wenlock multicoloured pen has 8 colours with Wenlock himself standing tall on top making it clear that it is an Olympic themed pen. Miss M loved this – the novelty of the 8 colours was sure to win her over but the little Wenlock gives it that added special touch. She has used it for both colouring small pictures and also practising her handwriting – the different colours definitely an added bonus to encourage and motivate her in this. We loved Wenlock and he has proved a firm favourite that has sat and watched the olympics with us. It has really helped Miss M engage with the Olympics and become a firm favourite with her. I think it’s great for children to have something to remember, not just the Olympics but the London 2012 Olympics!! This entry was posted in Reviews and tagged London 2012, olympic mascot, Olympics, Wenlock by Fiona Martin. Bookmark the permalink.